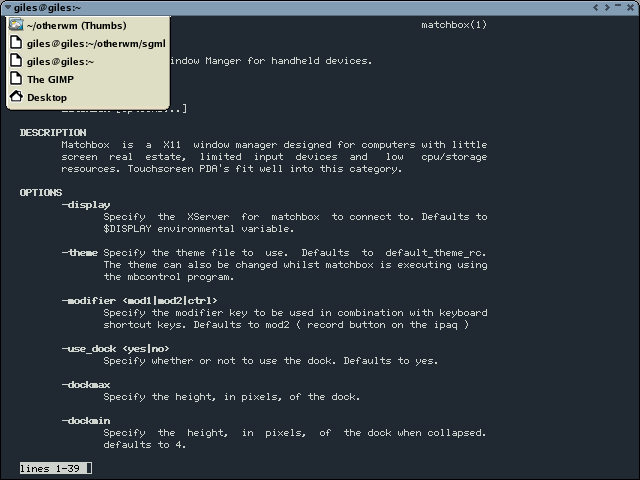 Screenshot of Matchbox, showing the term completely filling the screen (all windows completely fill the screen). 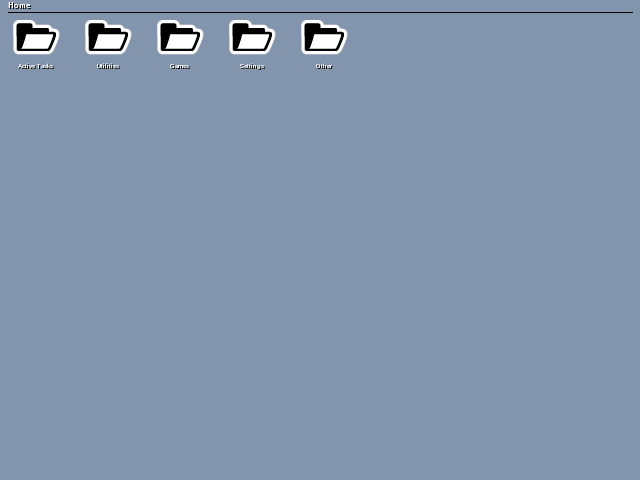 The drop arrow at the upper left gives access to the menu shown, which in turn allows access to all running tasks and the desktop. The two arrows in the upper right corner ("<" and ">") cycle through the running tasks, but don't access the desktop. The Matchbox desktop - Matchbox was designed for touch screen PDAs. Mediocre. The basics are there, but I had to guess my way to success. I still don't know how to add applications to the desktop listings. Yes. Change is primarily about the appearance and buttons on the titlebar. I tried this WM as an experiment. Matchbox is intended for touch screen PDAs, and as such is radically different in behaviour than most of the other WMs I tried when creating this paper. Lightweight. Works well for its intended purpose (PDAs). Simple. Not lightweight enough for its intended purpose? Desktop and WM together weigh in at over 2 Mb. Hard to configure without more complete docs.